After resting in Lukla, the team continued to hike upward and made it to Namche Bazaar. At 3500 metres, it was time to implement their acclimatization strategy to keep the team healthy as the air became thinner and less accommodating. Altitude sickness and other complications are a prominent threat to climbers everywhere, and it’s become the standard to have an acclimatization plan. For theirs, the team scheduled two acclimatization days in the later portion of the trek. Each time, they’d hike up 500-700 meters and then back down again to help their bodies learn to accommodate the altitude. Along with these days, their acclimatization strategy included monitoring their pace during the trek — with their canoes, they went at about half the pace of regular hikers. In Namche Bazaar, the team had their first acclimatization day. 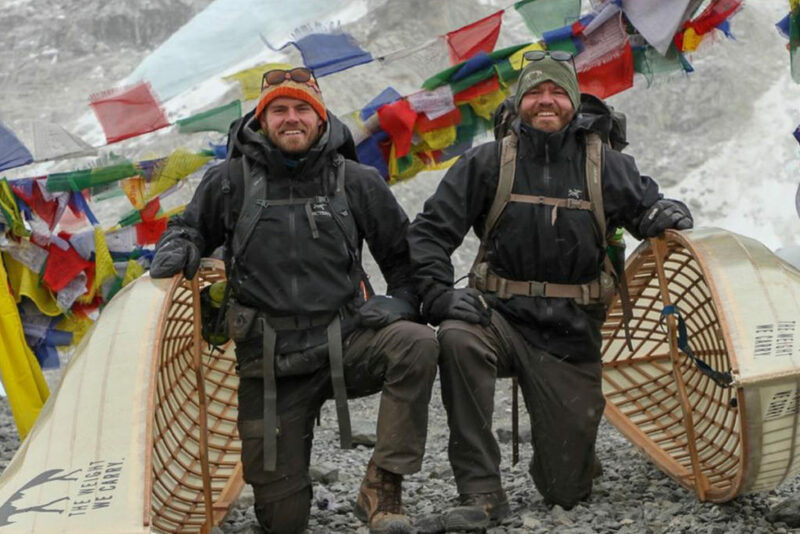 Kyle and Tom got to abandon their canoes, and the team climbed from 3500 to 4000 meters, equipped with daypacks and camera bags instead of the usual heavy load. Kyle describes it almost as having a rest day; despite the difficult altitude, abandoning the packs and canoes feels like a break. It gave the team the opportunity to bring their focus away from their feat and towards the beauty of the mountains around them, happy to be in each other’s company. After spending one more night in Namche Bazaar, the team stopped in Tengboche and then Dingboche, where they’d have their second acclimatization day. Dingboche sits at 4400 metres above sea level. It’s a common place to stop and acclimatize because it has access to a 5100 metre peak called Nangar Tsang. Maggie and Fiona went lower but Kyle, Tom, Seton, and Dane hiked to the summit. Far from the treeline and exposed to the surrounding atmosphere of jagged ridges and patches of snow, the peak is known for its views of the Himalayas, and the team didn’t miss out. The two nights in Dingboche were freezing cold, the temperature sometimes dipping below -20°C. But the team otherwise had good weather for their stay in the town, and the clarity allowed them to truly experience its beauty. Deep in the mountains, the atmosphere fosters a feeling of spiritual solitude and peace, immersed in the raw experience of mountaineering. Instead of feeling trapped when surrounded by the Himalaya on every side, there’s an overwhelming sense of freedom. Dingboche served to be the perfect place for self-reflection. When Kyle and Tom visited Dingboche two years ago, Tom found a stupa, a traditionally Buddhist place of meditation. This time around he visited the same spot, poised on a nearby hill, and meditated a few times during the stay. This practice had become pretty common throughout the trip. On a journey packed with action every day, as well as catching up on maintaining social media and speaking to family, the team tried to find time to reflect and breathe during those busy days. Even five or ten minute breaks were beneficial. Tom says that having an intent for the day—to be present, to practice self-love, to solve a problem, to appreciate the moment—helped the trip flow smoothly. After enjoying Dingboche, the team reached Lobuche. The successful day of trekking was another one of the little victories during the trip. Kyle’s knee issues were at their peak at this point two years ago, to the point where he could barely make it up this ascent. But this time—in Tom’s words—he smashed it. It wasn’t all easy though. The higher the team had been going in the past few days, the harder it was to breathe in the thin air. They sometimes found themselves walking only baby steps, because any more exertion made them gasp for more oxygen. Another difficult factor, one that most hikers don’t have to face, is handling the canoes in the mountain winds. When carrying an object with such a large surface area, it almost acts as a sail, trying to blow off-course. But putting one foot in front of the other and setting a slow pace, the team soldiered on. The night in Lobuche was another cold one at 4900 metres. It was so cold that the water in their tea-house would freeze, including their personal water bottles and the Nepalese-style toilets. Despite the fatigue that came after every long day, the team was still finding it difficult to sleep. The high altitude, oxygen-poor air, and crippling cold make it hard to rest. They would sometimes wake up in the middle of the night interrupted by their body’s need for more oxygen, lying in bed and gasping for air, trying to ignore it and go back to sleep. And many mountaineers—including this team—take Diamox to assist with adjusting to altitude, and its side effects don’t help. Along with the fatigue from the long days and long nights, the team wasn’t eating well, either. Such high altitudes don’t support much life, and most food has to be transported from lower altitudes. Because of this, it’s hard to get a good meal, and frequently they would feel sick from the food. But the optimism of being so close to Base Camp and the spirit of the expedition kept them going. The next day, they headed to Gorakshep, which was the last town they needed to hit before making the push to Base Camp. 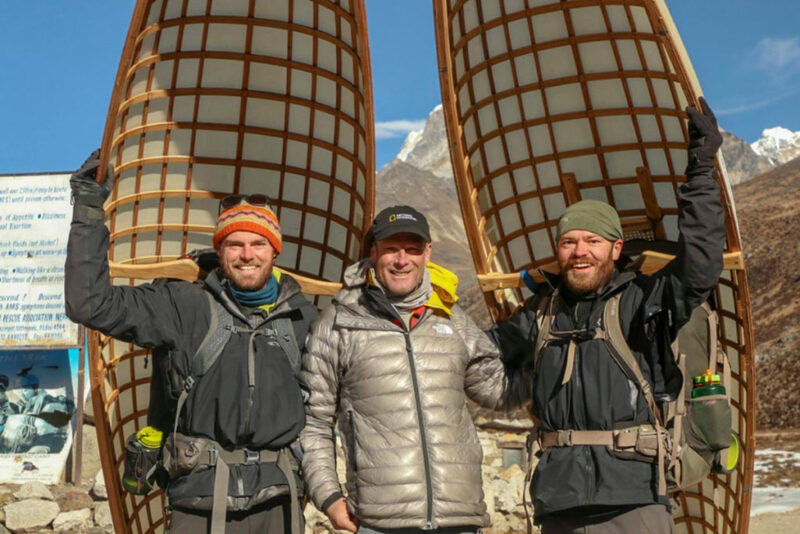 It’s more of a collection of tea houses or lodges than a village, and at just over 5100 metres, it was the highest that the team had climbed so far. Gorakshep forks into two routes: one headed to Base Camp, and the other to a peak called Kala Pattar, which many mountaineers summit during their stay. From Everest Base Camp, despite its title, there’s no view of the mountain. Kala Pattar offers more exposure to the surrounding peaks and a perfect view of Everest’s summit. 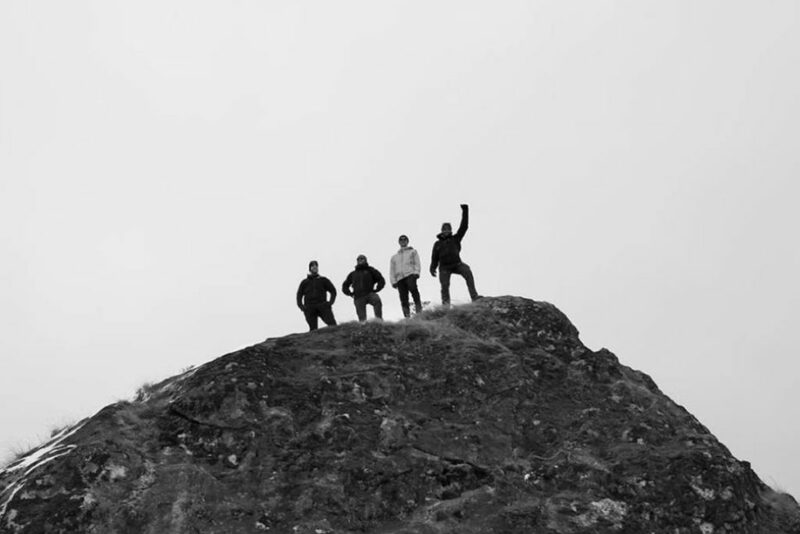 After arriving in Gorakshep that day, Kyle, Tom, Seton, and Dane summited Kala Pattar to explore and take some photos. 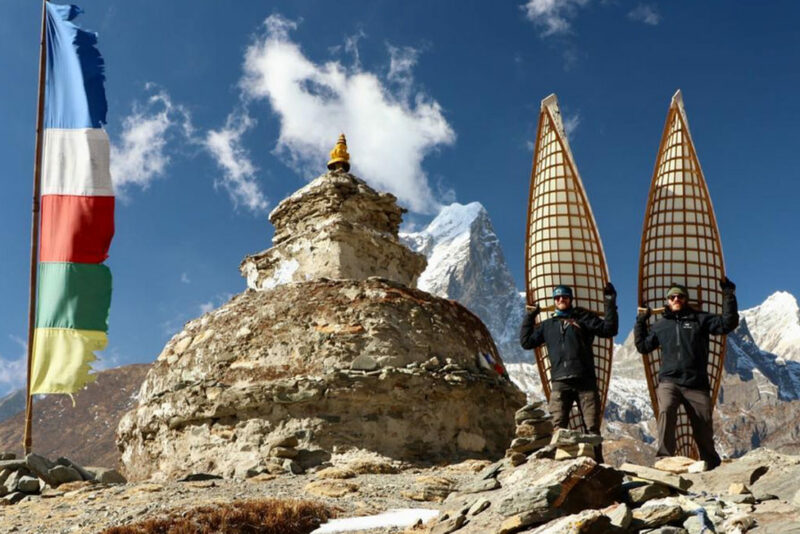 They took the canoes halfway up and then continued without them to appreciate the lightness of trekking to the peak. At 5620 metres, they used the hike to further acclimatize, but more meaningful was the scenery. 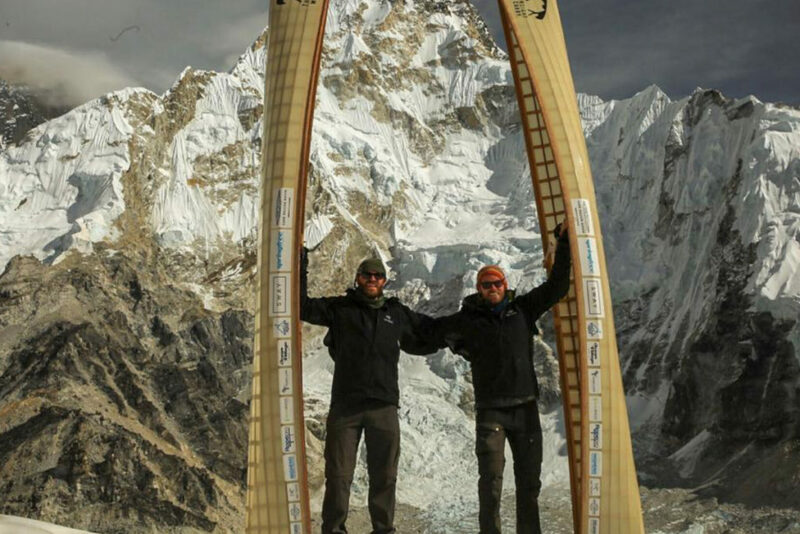 Last time Kyle and Tom climbed Kala Pattar, two years ago, it was too cold to stay very long. But this time the group lingered for about 40 minutes, taking in the view of the mountains and chatting about their feat. Moments like these, of spending time with friends and family, taking time to appreciate the moment, were always highlights. The team tried their best to get a good night’s sleep before making the final hike to Everest Base Camp. They set out at about 8:30 in the morning to make the most of the day. For two hours, they hiked along the edge of the Khumbu glacier, sometimes trekking on the ice itself. Kyle and Tom had an advantage at this point; they could see and recognize when they were getting close based on their past experience. Despite the anticipation, they still took it slow, but the giddiness continued to build as they approached Everest Base Camp. When they were about 20 minutes away, the excitement really settled in. Not only had reaching EBC been a goal over the past three weeks, it had been almost two years since The Weight We Carry was born and the team started planning the trip. The emotion and energy put into the project was going to reach its own summit, and that was a feat in itself. When they reached Base Camp, it felt unreal at first. Kyle and Tom rose their canoes above their heads in triumph, and tears started flowing shortly after. All six of the hikers—Kyle, Tom, Seton, Dane, Maggie, and Fiona—made it, and that was something to cry about. Throughout the trip, there were constant anxieties and questions running through their heads: Would they lack the endurance to make it to Base Camp with the canoes? Would someone get altitude sickness, or another suffer an injury that would keep them from continuing? Now the weight of second-guessing could finally be gone, and they could appreciate the victory of what they’d accomplished. It was another cold day and the team had other goals to meet, so they didn’t stay at Base Camp for long. But while there they took photos and celebrated, Seton did some filming, and each member of the team had the opportunity to speak to the camera about what the moment meant to them. Though the moment was overwhelming, they stepped back and looked at the bigger picture of what reaching Base Camp symbolized. The Weight We Carry works with Koshish to benefit the people of Nepal and provide support after times of trauma, loss, and the resulting mental illness. But the organization aims to spread awareness about mental health efforts in North America, too. 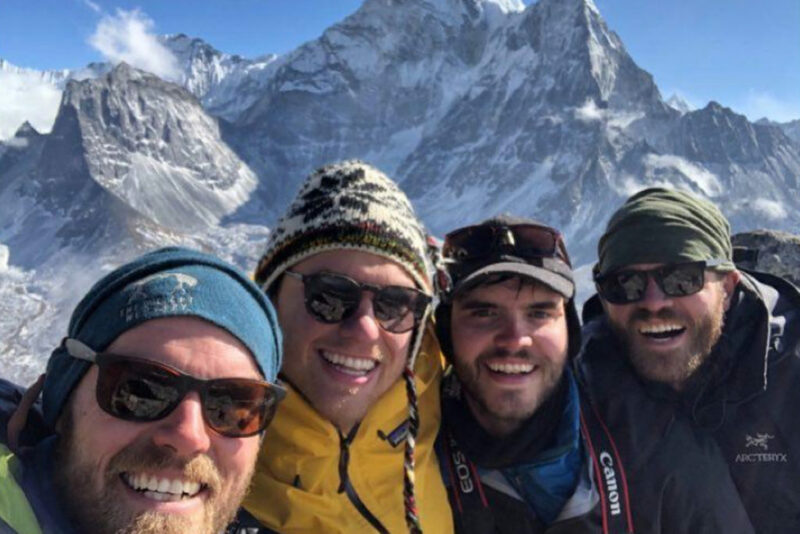 While at Everest Base Camp, the team reflected on the way their own lives, and the lives of the people around them, have been touched by mental illness. Everybody has a different reason why it matters to them. The group brought along photos of friends, and friends of friends, who had passed away—mostly those who had lost their battles with mental illness and died by suicide. They took pictures with those photos beside the canoes and the prayer flags that decorate the camp. They reflected on those losses and how they shaped the lives of the people who loved them. Mental illness is an extremely personal subject, and anecdotes such as those are often driving force of mental health efforts. Both Kyle and Tom have been personally impacted by their own struggles with mental illness. Tom has a steady therapist back home and has been working on self-love and acceptance for the past few years. Kyle struggled with anxiety as a teenager and uses mindfulness and meditation to channel negative energy. Having grown up in a position of privilege, they’re lucky to have access to mental health resources and a strong, supportive community. It’s important to use that privilege to make a difference for friends and strangers alike. After the period of celebration and reflection, the team came down from Everest Base Camp. They decided to alter their plans; instead of going straight to Lobuche, they spent another night in Gorakshep. They were wary of spending another night at such a high altitude, because it was so difficult to sleep, but Maggie had a migraine and they didn’t want to risk it becoming something worse. They had an early start the next morning to descend from Gorakshep down to Pheriche. It was a different route than what they’d done on the way up, and although the change in scenery was welcome, the terrain was much more difficult. The hike was rocky and full of tricky maneuvers, especially with the canoes. It was also the windiest day they’d experienced in the trip thus far, which made the cold sting even more. But they set a good pace and throughout the day the descent became easier. The scenery was worth the struggle and they covered plenty of distance. Pheriche is a beautiful valley town surrounded by mountains on all sides, another common place for trekkers to stop and rest. It’s common enough, in fact, that the team ran into a National Geographic expedition of scientists who were staying in the same tea house as The Weight We Carry. The leader of the NatGeo group happened to be Conrad Anker, a highly regarded mountaineer and one of Kyle and Tom’s inspirations. Conrad told them he was impressed to see people making a difference in Nepal and using their sense of adventure to help others. They mingled and chatted with the other team over hot tea, slightly awestruck. The next morning, they got a thumbs up and pat on the back from Conrad, an extra bit of encouragement for the rest of the journey. They then went to Dingboche, which they’d already hit on the way up the Everest Base Camp. At this point in the descent, having seen the sights already and falling deeper into their daily routine, the team was eager to get back to Lukla. One advantage of heading closer to sea level was the change in air quality. The team became faster and faster as the atmosphere around them became more welcoming and oxygen-rich. After Dingboche was Tengboche, another beautiful hike that dipped above and below the tree line as they descended. It was a shorter day, and although they could have pushed farther they decided to stop and get some rest. They were also already ahead of schedule and could afford to take the time and see Tengboche’s sights, namely a famous Buddhist monastery with cliffside views at 3800 metres above sea level. The feeling was increasingly bittersweet; the team was excited to get home but they’d be soon be missing out on the clean air, the mountain views, and the hiking routine. Then they headed from Tengboche to Namche, which would be a longer day: about ten kilometres. The team felt strong and well-rested, and as the pathway became wider they could walk beside each other for the first time in a couple of weeks. The goal was to hit Namche for a late lunch and visit a bakery that they knew made good pizza. They had another relaxing afternoon with good food and a beer each. At 3400 metres, the living felt easy compared to towns at higher altitudes. The trekking felt increasingly easier as they became closer to sea level. At the beginning of the trip, there was more trial and error of the best way to carry the boats safely. Kyle and Tom had done countless portages before, up to seven kilometres at a time, but carrying canoes day in and day out required some different strategies. Once they reached a comfortable routine the hikes started to blend together with the rhythm of the journey. The next day they hiked another ten kilometres to Phakding, which was at 2600 metres above sea level. It was going smoothly, but on the way there the team had to travel through Monjo, where they’d reach an outpost check and confirm their trekker permits in order to continue with the trip. The main purpose of this check is to ensure the hikers who enter the area eventually leave and haven’t run into trouble. 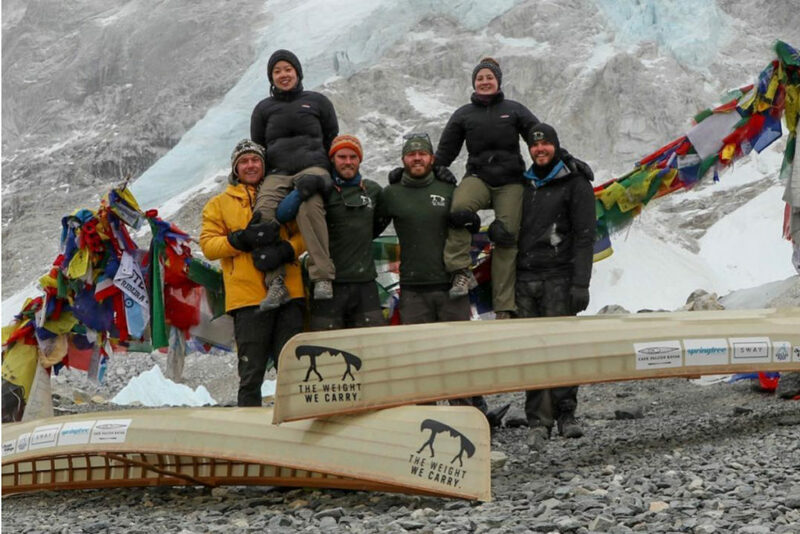 The team had been running on a good streak with the canoes, but here the Monjo authorities tried to charge them a fee; Kyle and Tom hadn’t had to pay a fee for the canoes on their way in, and knew it would be unnecessary to pay one now. They’d already spoken with Nepal’s director of tourism and they had their permits in order. On such an expedition, it was important to check and double check everything to avoid as much trouble as possible. Eventually, they convinced the outpost authorities that they didn’t have to pay the fee, which was lucky but the time set the team behind schedule. After Monjo they hiked another two and a half hours and arrived in Phakding. They had another peaceful night with the view of the river flowing through the town. The bittersweet feelings were getting stronger as the end of the journey became closer. The hike from Phakding to Lukla the next day was short but difficult. They pushed the two and a half hours without any breaks, both as an extra challenge and to save some time. The last stretch into Lukla was steep, but the team climbed the final stone steps with triumph, and thus the hiking portion of the trip was over. Feeling tired but accomplished, they ate lunch in the town and let the feeling of being finished settle in. For the past month or so they’d been continuing the same routine nearly every day: wake up, pack up, put the canoes on and hike to the next destination. But instead, the next day they planned to fly from the Lukla airport into Kathmandu. But as we’ve learned, sometimes things don’t go as planned. When they woke up the next day the town was surrounded by falling snow, so much that the team could barely see ten metres in front of them. The Lukla airport is already precarious; because it’s surrounded by mountains, the runway can only be so long, and visibility has to be perfect for safe takeoff. Some consider it the most dangerous airport in the world. So the team had another day to relax in Lukla, playing cards, chatting, and reflecting on the trip as they waited for the storm to pass. They were still 25 days without showers, and had been ready to leave and get home, but they tried not to let the delay get them down. Their flight the next day was still delayed by five hours, but the team felt lucky to be on their way to Kathmandu nonetheless. Back in the familiar space, they took the opportunity to really commemorate the end of the trip. Their hotel was in Thamel, Kathmandu’s tourist area, which was full of restaurants, shops, and vendors. They ordered a feast both to celebrate and to take advantage of the quality and variety of the food, which was much greater compared to their meals at higher altitudes. They spent a few days in Kathmandu to enjoy their last bit of time in Nepal. 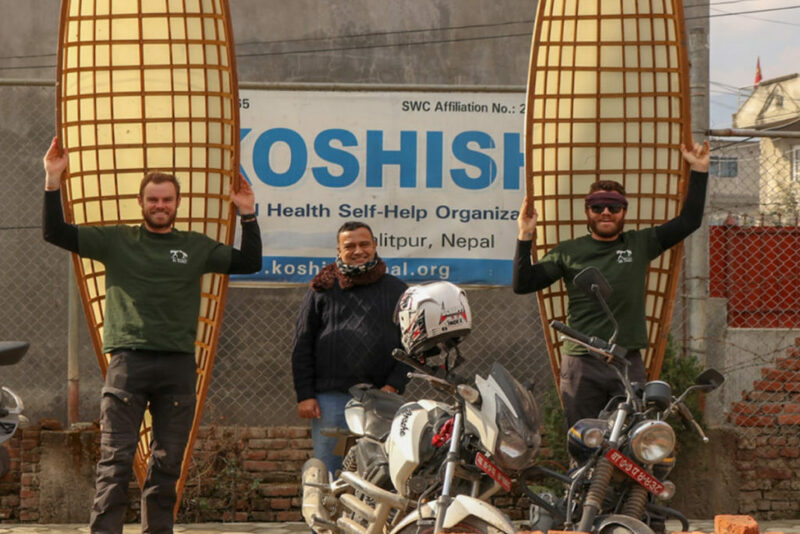 The team was slowly flying out of Asia and back home, but Kyle and Tom stayed the longest to make contact with Koshish, the Nepalese charity receiving The Weight We Carry’s donations. While the team was on their trek, Koshish managed to secure a plot of land on which to build the women’s transit centre. The land marks the tangible beginning of the project, and Kyle and Tom were lucky enough to visit the plot with Matrika, Koshish’s chairperson. The property is about a 45 minute drive out of Kathmandu, an acre of land perfect for fresh air, farming, and healing those who need the help. As of the end of the trip, The Weight We Carry has raised about $75 000, halfway to their goal. 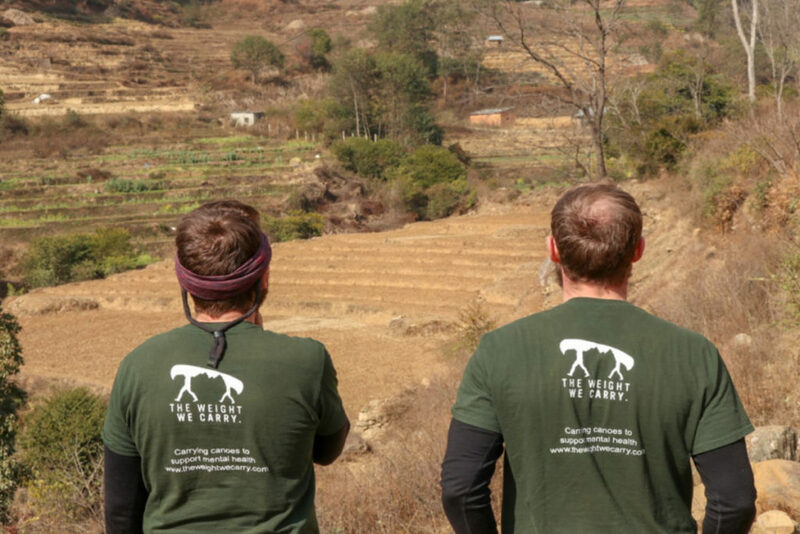 Although the team are resuming their lives in different places around the world, they’re continuing their efforts to raise money for Koshish and spread the word. Everest Base Camp was an exciting adventure, but for Koshish it’s only the beginning of the start of something new.